22nd November, the day of the last post, saw no winds. We were becalmed and I took the opportunity to take bath. It was only then that I realised that my skin was not dark because of tan but because of grime. Lynn says, the boat would move faster only if I washed off the weight of grime everyday. 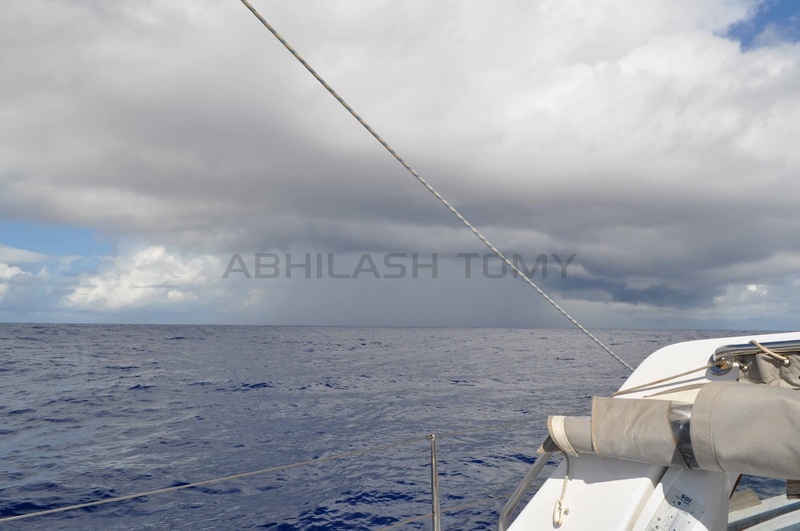 Somehow, there is a correlation - each time I have had a shower at sea, the boat has come out of its sluggish sloshing and gathered speed with a determination. No wonder sailors are a superstitious lot. Thank you, Lynn. 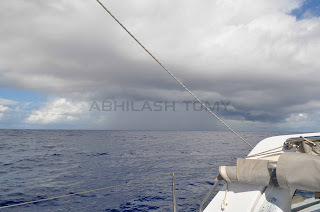 The Mhadei and I found the trade winds that very noon and almost two hours later, we were scudding alone at a healthy speed of 8 knots upwind despite the reef on the main. As usual, the onset was announced by gathering clouds. That day our southward plunge started and we were on our way to the Tropic of Capricorn and from there to the eastbound highway. We have been eating away latitudes ever since hitting the trades and as I write this, I am almost in the same latitude, albeit south of the Equator, as Mumbai. The nights have been cloudless though and stars have come out in strength. Ever since the passing of Dewali, the moon has been waxing and nights have become lit with so much moonlight that I wished it was night all day long. Things have been going on pretty well with the boat but for the generator which was continuously dogged by low oil pressure warning. I spent considerable time trying to find out the reason and it was certain that the lube oil was not the cause for we had only recently serviced the generator. Nevertheless, I checked the lube oil level which was well within limits. After much deliberation, I remembered the words of the mechanic from Laurenco Marine who had mentioned that lube oil could lose its viscosity if it became too hot and pressure might drop. That forced me to check the cooling system and sure enough, there lay the fault! After that, it was just a matter of minutes before the problem was resolved. Its working well now, as if we are not sailing at all but it was a Sunday in harbour. I need flats too! Its good time to recuperate. Thanks for the wishes though! Amazing pic... as if clouds have gathered curiously to see you brave man! Bravo Zulu .. U engineer ..
U deserve a BTECH Degree now..
Ha! Keep yours. My university doesn't give out degrees. Great going for sure !! Amazing -The Life of Tomy! Battle Speed! :) I would want to watch the Life of Pi when I get back for sure! Here you are! and I was wondering where you were Dr. This is wonderful! In addition to your obvious talents with sheets and rudders, you have a gift for the pen too! Keep up the good work. Hopefully this will result in a book someday. I hope so too sir! I know this might sound silly to you. But I'd like to know how you have a bath while sailing solo? I mean do you swim in the sea or do you draw water from the sea and pour it on you while in the boat or on the deck? etc... I think what is bothering me is what if the boat sails away while you are swimming? Becalmed, but where is the chopping board?